"You Europeans put a boiling pot on stove and it gets cold. We do the opposite." In fact I have no idea if this saying is genuinely Chinese but it probably contains some truth in it. Judging from world population statistics such an approach seems to have been working just as well - if not better - than the Western cultural heritage of romantic love. The tradition of romance becomes powerful during the Crusader period with that noble Love court of Eleanor of Aquitaine as an example of the times of castles, troubadours and husbands far away in the Holy Land. It surfaced again in the Romantic period, for example in the works of Sir Walter Scott (1771-1832) touching Western hearts of men and women then and now in literature, theatre and opera: Ivanhoe, Rob Roy, The Lady of the Lake, Waverley, The Heart of Midlothian and The Bride of Lammermoor. In traditional Chinese culture the influence of Confucius (孔夫子 pinyin Kǒng Fūzǐ) is felt in the deeply rooted respect for parents, elders and also ancestors as in Taoism. The old ones know what is best for the daughter and son also in matters of love and marriage. And often they do. The movie House of Flying Daggers describes pure romantic love that is tested by the actions of the characters in life and death battles. Is it genuine Tang period atmosphere or is is a modern westernised story set in history of completely different type of relationship between man and woman. In my opinion, romantic love exists in all humanity from cavemen to modern Chinese or native Americans. It is the matter of emphasis, matter of final decisions taken in matters of heart, that differs. A girl or boy may today leave parents to run after the lover in a different city or even different country and it is considered more or less normal. 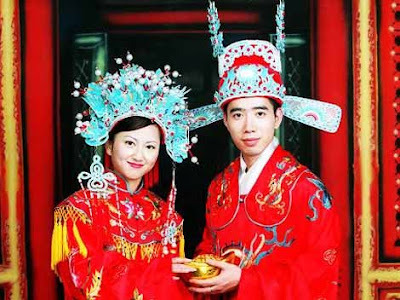 Chinese strictly traditional parents may also face - even in the Tang period - the power of romantic love in their children and must react to it. Similarly in the traditional Arabic culture where families decide, father decides (after the ladies of the two houses have quietly reached their decision) romantic love causes disruptions to orderly arrangements of marriages by social status, wealth and other important aspects. For romantic love is love, an important part of the system created by God of Israel in humans. It is perhaps not even limited to humans. I have noticed that one of the dogs here had a constant favourite among the pack of more or less handsome male dogs seeking to become father of her puppies. And it is said about the white swans that they are faithful lovers, the same couple reaching that quiet distant lake in the North year after year for the female to lay her eggs. In our eyes at least the noble swans are highly romantic as the other swan may wither away and die if the significant other is taken from him or her by death.